The Best 18 Wigwam® Holidays Sites with Hot Tub Glamping in the UK! So … who doesn’t like a hot tub? Hot tubs conjure up images of relaxed luxury: warm, soothing water; time to chill out; a chance to let those worries melt away in the comfort of a luxurious experience in a hot tub … There are numerous types of hot tubs: wood fired; whirlpool; bubbly; with or without coloured lights … the list goes on. You can even find portable or inflatable hot tubs and at the opposite end of the spectrum, ones cast in concrete as a permanent fixture. In recent years, hot tubs have become synonymous with glamping here in the UK. A hot tub can have pride of place next to nomadic-style yurt or adjacent a heated, spacious Wigwam® Cabin, perfect partners in the world of glamorous camping. Sitting in a hot tub encourages you to take time out, and enjoy the heated H2O as the sun shines or as the stars appear in the night sky. Open that bottle of bubbly … chink those glasses … sit back … relax. Enjoying the health benefits of heated water has been with us since ancient times. They can relax the muscles and allow your brain to unplug! Today you can enjoy a glamping hot tub experience with Wigwam® Holidays with having to worry about long haul flights, as all our sites are based here in the UK. With the glamping industry becoming ever more luxurious, hot tubs are increasingly high on customer’s ‘wish lists’. With the emphasis being upon sustainability, the wood fired variety of hot tub is a great partner with timber glamping cabins. The northerly nation of Sweden, famous for pop group Abba, Ikea and … meatballs … claims a big slice of hot tub heritage. Swedish hot tub designs are usually crafted from timber, heated by a fire lit near or beneath the circular ‘barrel’-like frame made from vertical staves. 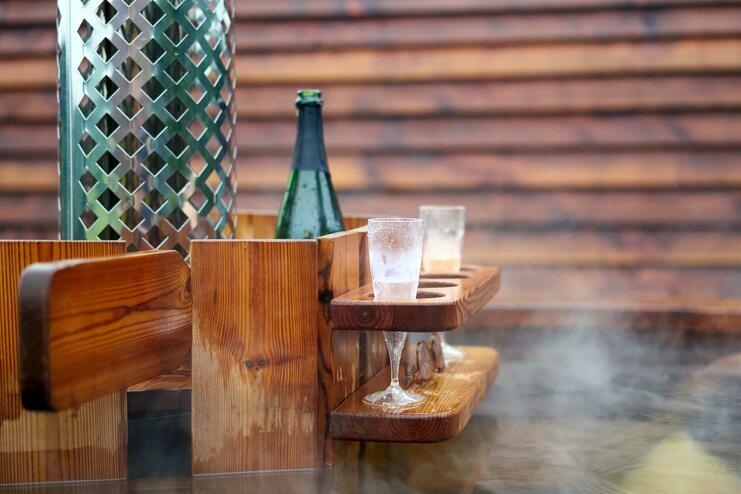 The wood fired hot tub does need some TLC to keep it up to temperature, and the use of paddles to stir the water is always one of the fun aspects of enjoying this type of hot tub. And that smell of fresh timber is always present, enhancing the sensory experience. A small number of steps or a stool is required to climb safely into the hot tub and there’s usually a lid that can be used to retain the heat. Yet it’s a real feather in your cap to keep the fire burning and the water hot. And it’s all part of the glamping experience, where Mother Nature is just a few feet away and you feel part and parcel of the natural surroundings. There are a number of Wigwam® Holidays sites which boast a hot tub with their fabulous Wigwam® Cabins. All part of the Wigwam® Network, each site is individually picturesque with the added bonus of hot tub heaven, too! Wigwam® Holidays Crowtree Located on the banks of the river Welland in rural Lincolnshire, under a thousand acres of sky, set among mature trees and open countryside. Wigwam® Holidays Humble Bee, North Yorkshire – a working farm in the rolling Yorkshire Wolds, with the farmer busy on his rounds and a selection of accommodation, close to the Yorkshire Coast. Wigwam® Holidays Evenlode, Cotswolds nestled in the heart of a working farm, close to Adlestrop Hill and the ancient market town of Stow-on-the-Wold. Enjoy the wide open spaces and life on the farm with all the animals. Wigwam® Holidays Pot-a-Doodle Do, Northumberland with spectacular views of Holy Island. Alnwick Castle, Paxton House, the Farne Islands, Heatherslaw light railway, and miles of unspoilt coastline. Wigwam® Holidays Secret Valley is based in the heart of the Quantock Hills, Somerset. An area of outstanding natural beauty, the site offers a prime location to escape and relax. Herding Hill Wigwams® Situated in the peaceful town of Haltwhistle, Northumberland, Herding Hill Farm is just a10-minute walk from Hadrian's Wall and only a short distance from the Northumberland National Park. Wigwam® Holidays Brampton, Cumbria Located in an elevated position surrounded by mature oak trees and close to a trout lake. Enjoy those tranquil evenings while toasting marshmallows. Hill Farm & Orchard Wigwams® Located along the banks of the Grand Union Canal in rural Buckinghamshire, Hill Farm & Orchard is a working farm surrounded by leafy fruit trees, grazing cattle, and one of the oldest sheep flocks in Britain. Knockaloebeg Farm Wigwams® are located on the stunning west coast of the Isle of Man on a working Manx farm at Kirk Patrick, near Peel. The ‘guests’ also include sheep, cattle, pigs, chickens, ducks, goats, ponies, dogs, cats and a rabbit! Wigwam® Holidays Builth Wells in Powys, Mid-Wales! The working farm site has the sounds of the surrounding countryside as its natural soundtrack, surrounded by sheep farms and lush pastures that form the backbone of proud Welsh agriculture. Braidhaugh Wigwams® are situated in scenic Perthshire on the shores the River Earn and just a short walk from the town of Crieff. Sauchope Links Beach Huts can be found on the beautiful Fife shoreline with panoramic views over the sea , close to the ancient and charming town of Crail and a sandy beach. Wigwam® Holidays Montrave Estate. Set in the picturesque countryside of the East Neuk of Fife, within beautiful woods and with access to a 250-acre estate and deer farm. Loch Tay Wigwams® Amid breath-taking scenery in the foothills of Ben Lawers and the shores of Loch Tay, and within driving distance of Edinburgh, Stirling and Glasgow. Hilly Cow Wigwams® is in the Pentland Hills on the edge of the historic town of Edinburgh. Find the culture of Scotland in a rural location. Wigwam® Holidays Wigtown At the edge the rolling Galloway hills, the coastal town of Wigtown is the closest place to this great holiday location. Prices start at £100 per night up to £160 depending on season, location and type of cabin. Book online here.